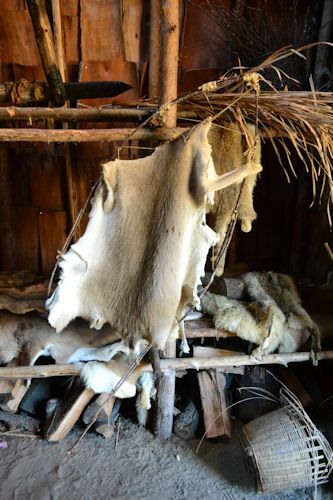 The Huron/Ouendat Village at the Huronia Museum in Midland, Ontario, Canada, represents life between AD 1500-1600, just prior to the arrival of Europeans. 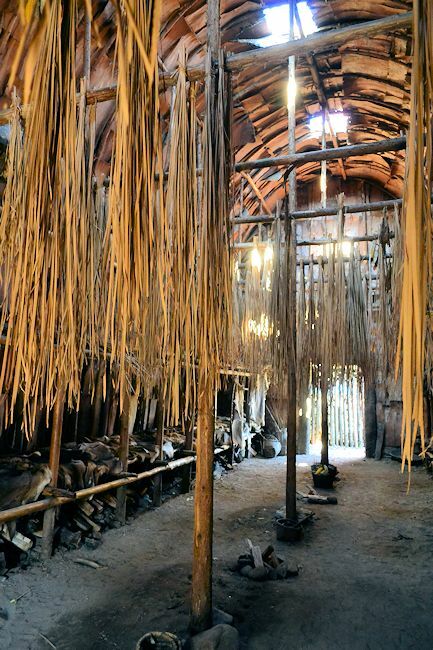 The village has the following components: shaman’s lodge, wigwam, masks, fish racks, longhouse, sweat lodge, corn field, bone pit, fur drying rack, and burial rack. 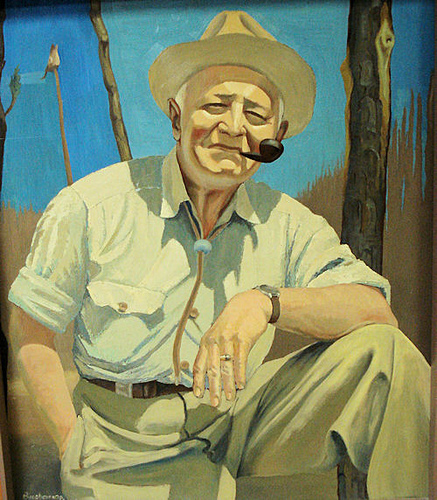 The Huron Village was created by W. Wilfrid Jury (1890-1981), Director of the Indian Archaeology and Pioneer Life at the University of Western Ontario in London. The village is modelled on Jury’s work on the excavation of the pre-contact Forget site near Midland. The village originally opened in 1956. 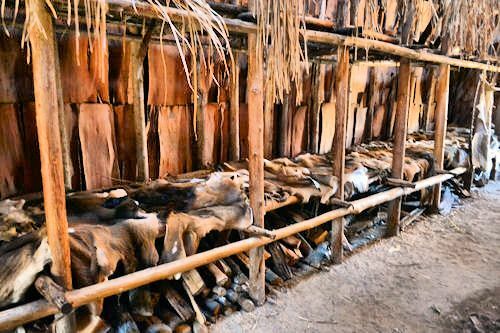 There are only a handful of locations where longhouses have been reconstructed. In May 2007, a fire destroyed part of the village. Reconstruction is underway, and the village is now open to the public. We have been working hard to make the village a safe and exciting experience for our visitors again following a fire on the 9th of May 2007. 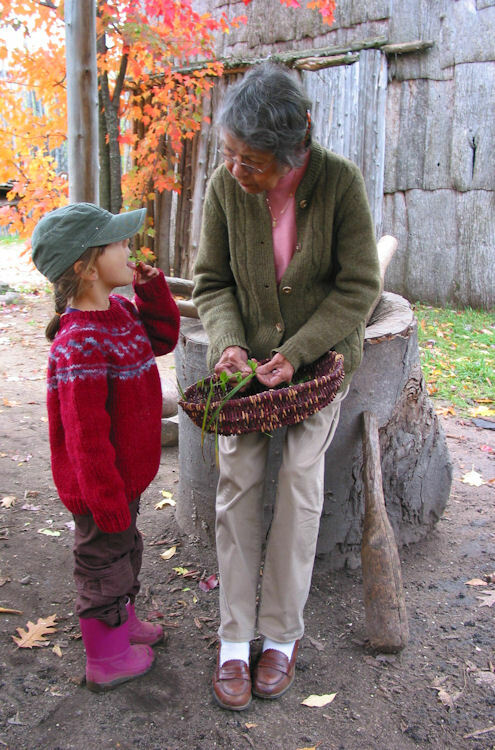 Now completely surrounded with palisade again, our visitors can once again step into our pre-contact Huron Ouendat village where they are greeted by friendly staff to share information and offer hourly guided tours. 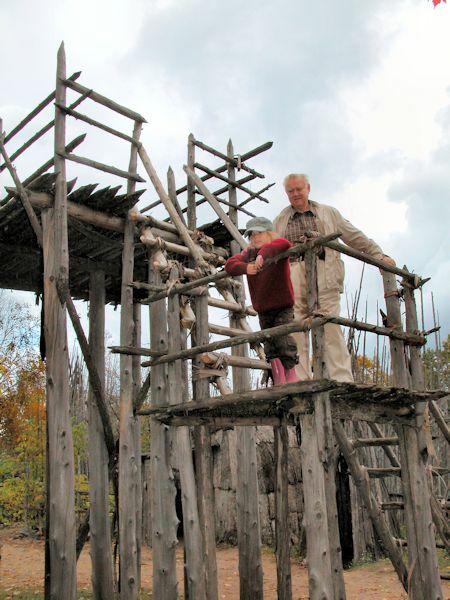 Visitors can climb our look out tower, imagine the surrounding landscape in the time of Huron and even try out the beds in the longhouse! 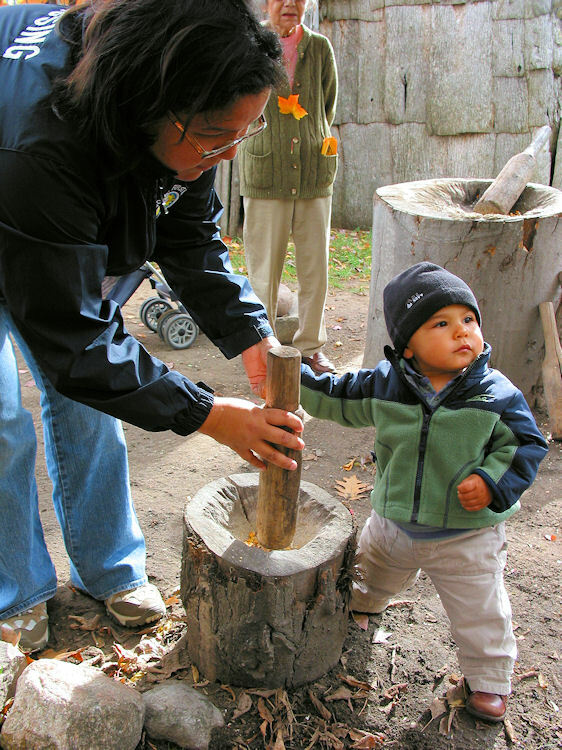 Kids can join the interpretive staff and make a little something to take home with them. 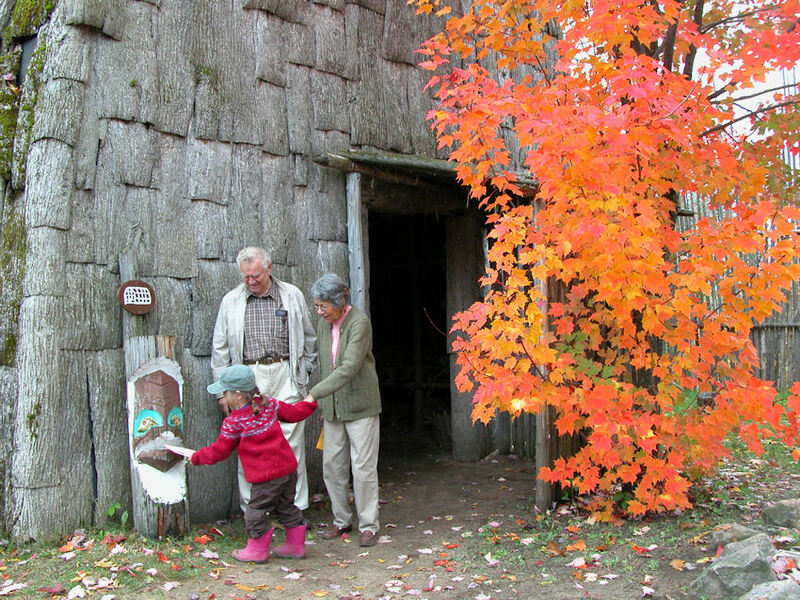 The Huron Ouendat Village is open every day from 9.00 am to 5.00 pm. Hello, my daughter will be on a class trip to Huron Village in mid November. She uses a walker and/or a wheelchair. Can you advise if the paths are accessible? The ground inside the village is quite hard packed so getting around should not be a difficulty. The path to the village is wood chip, but they are not very deep and so with a little extra push she should be fine. We have had many visitors in the past who used either a wheelchair or a walker and they were able to visit with no trouble. If you have any other questions please don’t hesitate to contact us again. Hello, can you also please advise if there are accessible washrooms in the village? There are unfortunately no washrooms at all in the Huron Villagem which is really a large outdoor exhibit. The museum’s main building, which is a short distance from the village has accessible washrooms. Thanks. We look forward to seeing you soon! I am traveling to Midland Huron Village on Friday July 17 with children and Grandchildren (17 in group). We would like to know prices before we arrive. If you arrive as a group (a group 5 or more) and would like to take advantage of the group rate, the admission rates for adults and seniors is then $6.50 and $5 for children. I hope this helps. We look froward to seeing you soon! PS: We have lots of different activities for children like treasure hunts in the museum and village. Be sure to ask for them! I brought my friend in September, to visit the village. I had described it to her, and she was looking forward to it. We were both VERY disappointed with the state of the village that you are still charging admission for. I understand there was a fire there, and it was explained to us that you are still awaiting insurance settlements, but there is modern stuff in there now, and wood piled high waiting to be made into something. We think admission should be free, or at best no more than a couple of dollars, because the village is pathetic. There is no atmosphere, no sense of what life may have been like, and really nothing to really see. We won’t be visiting again!!!!! Pre-contact Huron jewellery was made of bone, stone, shell, porcupine quill, and copper (which was obtained through trade). Unfortunately, none of the decorative objects in the museum’s collections have retained their dyes, though we do know from early-seventeenth century European writing that the Huron liked reds. I imagine that they experimented with a variety of vegetable and mineral dyes, and were able to obtain a range of colours and hues from them. We plan to make day trips throughout the summer based on the Grade 5 Social Studies curriculum expectations for our 9 year old daughter. Does the Huron Village cover any of these expectations? If so should we plan to be at the village for the entire day 9-5? Is there enough to keep our four daughters occupied, interested, and learning for eight hours? Are there picnic grounds, barbecue sites, cafeteria? Thank you. I haven’t been there since 1970. My husband and I will be going to the Huronia Museum sometime between April 27- and May 2nd this year. Years ago my father-A.E. Ingram created a diorama of the Huron Village. He then worked as an artist for the National Museum of Canada for the then Department of Northern Affaires and Natural Resources. I have seen pictures of the exhibit which was at the museum but would like to see the real thing as my father has since passed away. If I remember correctly my dad did a diorama of a Huron Village- also in the long house and with many of the Huron people and I think there was a Huron nativity scene. I hope you can tell me where these are. We leave for Collingwood this Saturday- April 26. Thank you. Has there ever been a wedding ceremony hosted in the village? We have had people inquire about wedding photos and similar things, but to my knowledge there hasn’t been a wedding in the village. I was pleased to see that the diorama by father (Arthur Edward Ingram) created of the Huron nativity scene is still intact and on display. Your museum is unique and I think it would be a wonderful backdrop to a modern wedding.